They were all pilgrims — Mary, Joseph, the angels, the shepherds, the Magi, and Jesus himself — people on a journey with a spiritual purpose. Bethlehem was their common destination. A long-awaited birth was the occasion. Join the pilgrimage in Christmas Pilgrims — A Journey to See Jesus. 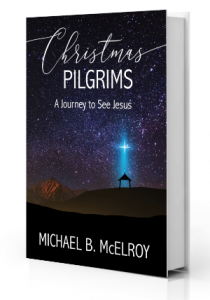 This book is a collection of stories based on the people and events in the Biblical narrative about the birth of Jesus Christ. There’s a text, story, and focus questions for daily meditation and personal application. Christmas Pilgrims is an ideal devotional for the 30 busy days before Christmas or any other time you need to refresh your sense of wonder. You can read several sample chapters here, and when you’re ready, you can also buy your copy today — in print and Kindle editions — from Amazon.com.